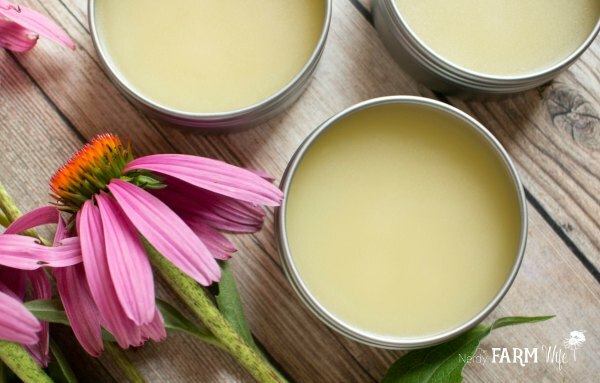 This echinacea salve is made from the leaves & flowers of purple coneflower (Echinacea pupurea). It’s simple to make & handy to keep in your first aid kit or backpack while hiking and camping. I like using sunflower oil in salve recipes, since it’s effective at healing damaged skin, but you could also use olive, sweet almond or another similar oil instead. Don’t have echinacea flowers or leaves handy? You can buy the dried herb HERE, from Mountain Rose Herbs. It’s difficult to recommend a precise amount of echinacea flowers and leaves, since they vary in size, but the petals from 4 or 5 flowers, plus several leaves, should be a good starting place. Dry the flowers and leaves by spreading them out over a clean dishcloth or paper towels for several days. You could also use a dehydrator set to around 95°F (35°C). Once completely dry, place the petals and leave in a small glass canning jar or similar container. 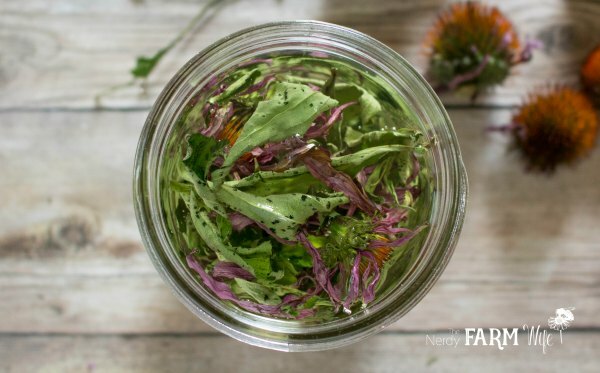 I mostly use just the flower petals and leaves, though if a flowerhead is extra small and I’m sure it’s completely dried, will add the whole thing into the jar too. Pour the oil over the herbs, adding more oil if needed, to make sure the plant matter is completely covered. Set the oil aside for 4 to 6 weeks to infuse, then strain. For a quicker infusion, set the jar down into a small saucepan filled with a few inches of water. Heat over a low burner for a few hours, keeping a close eye that the water doesn’t evaporate out. Remove from heat, cool until comfortable to handle, then strain. Strain the infused oil and weigh out 3.5 oz (100 g). Combine the infused oil with the beeswax in a canning jar or heatproof container. Set the jar down into a small pan filled with a few inches of water, creating a makeshift double boiler. Place the pan over medium-low heat until the beeswax is melted. Let cool a few minutes, then add the lavender essential oil, if using. Pour into jars or tins. If you used a small canning jar for melting, you could just leave it in there for storage too, to save on cleanup time. This recipe fills three 2-oz tins, when filled not quite to the top of each tin. Or, you could pour it right to the top of a larger 4-oz tin or jar. Shelf life of this salve is at least 9 to 12 months, depending on storage and freshness of the oil used. Store in a cool area, out of direct sunlight. 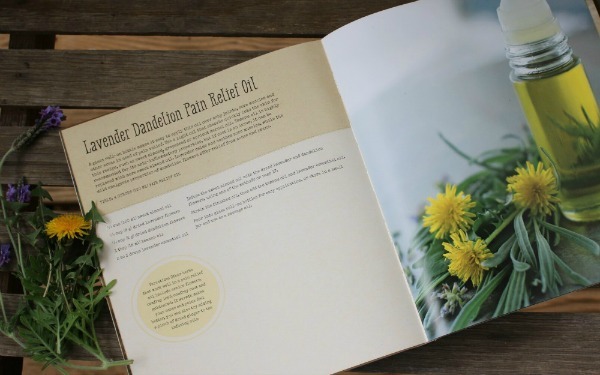 You may prefer a softer or harder salve than what this recipe makes. Or, you may want a firmer product for hot weather and a softer one for cooler weather. If you find the salve too soft or too hard for your needs, you can melt it again, adding more beeswax for a firmer salve, or more oil for a softer salve. 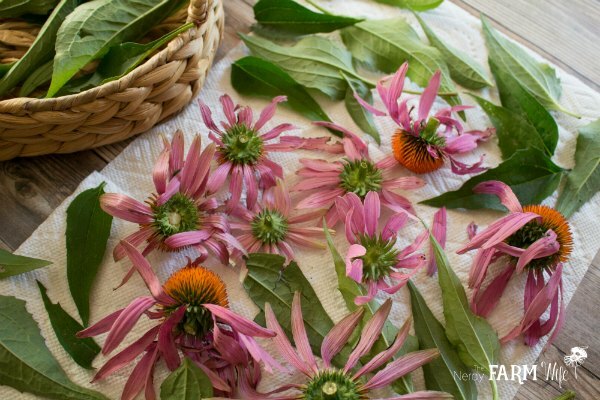 If you enjoyed learning how to make echinacea infused oil and salve, let’s keep in touch! 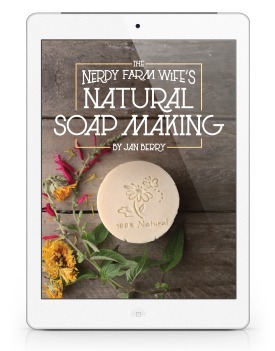 Subscribe to my newsletter to receive my best herbal projects, natural soap ideas, and DIY body care recipes sent straight to your inbox, two to four times per month. Find it at Amazon or ask your favorite bookseller about it! Tagged echinacea, purple coneflower, salve. Bookmark the permalink. I was wondering if you could use for tea also? Wow, awesome! We have these in our garden, so it’s useful to know something you can make out of them. Hello! Thanks for the recipe, just started a batch today. I was wondering if there was any reason in particular that you used sunflower oil, or would other types of oil also work? I just finished 2 batches of this. I infused my coneflowers for 6 weeks. Added 6 drops of lavender oil to the first batch and 4 each of lavender and frankincense to the second batch. Filled 16 small lip balm containers and 4 2 oz containers. Put about 1/2 oz.that was left in a 2 oz container for immediate use. Used some of the extra on my lips. Feels nice and tastes ok. Soothing. Thanks for the recipe! 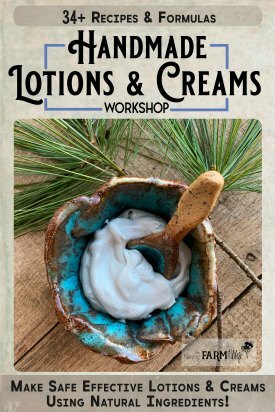 How much of the leaves do you use to make the salve?